Hi here Marco again :) Saturday 16 of June is the father's day here in England... every father will recive a present from his family.. in toyday toyshop you can find a lot of things for him, a lot of old toys that he would like... I was thinking to make a present to my "new" father here in Totnes. 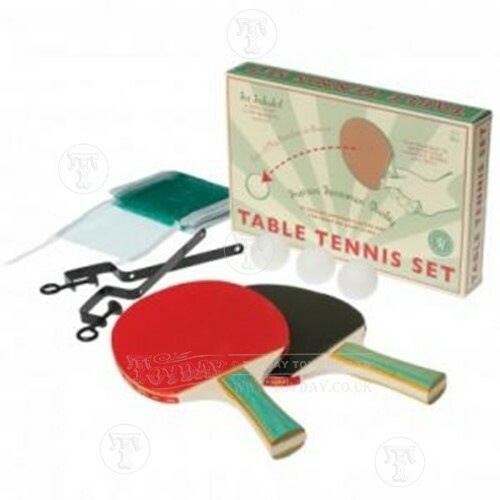 The game of tabletop tennis, like many others was invented by the British. During the 1800s gentleman would regularly retire to the smoking room after dining for a brandy and an impromptu game of tabletop tennis. Using nothing more than a line of hardbacks as a net and cigar boxes as bats they would "crack" champagne corks to and fro across a large tabletop. From these simple beginnings evolved the sport that we see played by today's modern sporting stars in tournaments across the globe. A game shall be won by the player first scoring eleven points unless both players score ten points, when the game shall be won by the first player subsequently gaining a lead two points. A match shall consist of the best of any odd number of games. In my opinion table tennis is one of the best sports because it is easy to play but and at the same time you can enjoy a lot. You can also play doubles with a lot of friends.